Back after the election was determined, I used the tag cloud generator Wordle.net to analyze Barack Obama’s acceptance speech. Just to follow-up, I decided that the same type of analysis would be usefully applied to Obama’s most recent big speech: his 2013 State of the Union Speech (SOTUS, as we now say in this Twitter, character obsessed age). The speech just concluded, but thanks to The Atlantic, we already have a complete transcript of the speech. Given the nature and purpose of State of the Union speeches, it is no surprise that the terms of “America,” “American,” and “Americans” would be so predominant in the speech. The SOTUS is the president’s address to the Congress, as well as other branches of the government, on how the country is faring, as well as his vision for how it could fare better. The focus is on what is happening in America, to Americans, and what could be done to improve our combined lot. With the SOTUS being televised, it is also a chance for the president to address the American public, almost from the so-called “bully pulpit”, to try to convince the American public of his vision and persuade them to his side. Thus the speech is to America and Americans, about America and Americans, and this purpose is continually reaffirmed by the use of those terms. 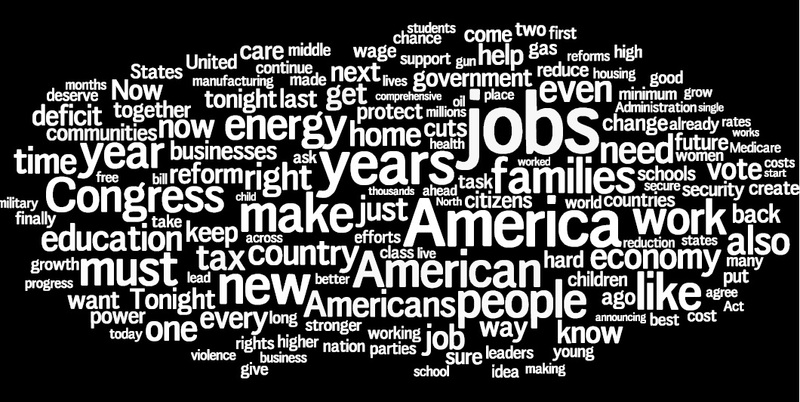 However, those terms were not the feature of the speech: “jobs” was the single word most often uttered in the speech, and “work” was pretty prominent as well. This focus on the theme of employment was expected by analysts and pundits, who felt that the President had to address the ongoing economic strain being felt across the country. And a good portion of his speech — perhaps the first act of it — was focused on his vision for what can be done to lessen this strain. The fact that “families” was so predominant ties into this theme, as he was addressing the needs of working class and middle class families in these trying economic times. Interestingly, “education” and “energy” were also rather high in mentions. Their recurrences are most likely due to how often Obama linked these industries to his vision for how to improve our economic condition. He was not only presenting short term fixes for our current crisis, but also long term ideas for how to better ensure that it does not happen again. And improving our energy and education industries and infrastructures was argued as one way to do so: investments in the future, as it were. One last thing to point out: there were some forceful words that were routinely mentioned. “Must,” “make,” “need,” “get,” and “now” all indicate the extent to which the President was hoping to drive home the urgency for Congress to act upon his ideas. But, given how the Republican congressional delegates were not exactly responding favorably to his domestic policies, such forceful words were probably not having an impact on them. Indeed, they may not have been intended for those in the chambers. Instead, they may have been intended for the viewing public. Again, the idea of the bully pulpit comes into play, as the President may have been trying to reach out to Americans and persuade them about the urgency of taking action, his actions. This basic rhetoric of using such words may have been an attempt to add emotional heft to the arguments he was making. Because it is a response, the prominence of “President” is understandable, as the senator would be countering or agreeing with what was said in the SOTUS by the President. Directly referring to him by his title is a common sign of courtesy in these responses. Also, the appearance of “middle class”, even if two separate words, indicates the audience to whom the GOP was speaking in their response, covering many of the same themes as the President in his. More government isn’t going to help you get ahead. It’s going to hold you back. More government isn’t going to create more opportunities. It’s going to limit them. As the response is not given in the chambers, it is aimed directly at the American public, with the intent of allowing the opposing party to the President’s a chance to offer their vision on the state of the union and what should be done to improve it. 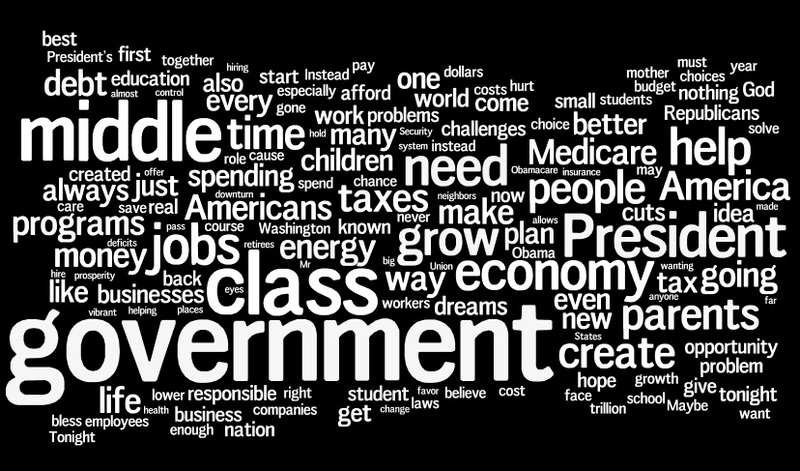 And the USA Today did a quickie social media tag cloud to see how the American public was responding — at least to the President’s vision. Definitely not scientific, as the responses were most likely from those motivated enough to express themselves via the social media (and how in particular their thoughts were gathered is not made clear). To be fair and balanced, I would hope they do one to Rubio’s speech, but given that the audience drops after the SOTUS, comparison may not be possible.